One of the Enlightenment’s key legacies has been the rise of a secular, even atheistic, approach to human reason, in which belief in the supernatural is seen as distinct from and often antithetical to rational thought. Over the past decade, a number of scientific studies have been published supporting the so-called Intuitive Belief Hypothesis, which associates intuitive thinking styles with religious belief — some even suggesting that priming people to think more analytically suppresses their supernatural beliefs. Drawing on the insights of researchers like Nobel economics laureate Daniel Kahneman, cognitive psychologists have theorized that slow, analytical rational thought is a relatively recent evolutionary adaptation that exists alongside humans’ evolutionarily more ancient, quick, and instinctive way of thinking. When the two styles of thought conflict, the hypothesis claims, slower-thinking rationality must actively suppress the more intuitive response. In light of those findings, Miguel Farias, a U.K.-based experimental psychologist who studies the ways that religious beliefs alter people’s experiences, reasoned that if tendencies towards religious belief and non-belief are indeed part of the same dual system of thought, then one could experimentally suppress or enhance these sorts of rational thought processes to alter how people think about the supernatural. To test this this theory, Farias set his sights on the right inferior frontal gyrus (rIFG), a small section of the brain’s frontal lobe that is thought to be the key locus of inhibitory control, helping the brain mediate between the two distinct types of thinking. Previous studies have shown that a noninvasive technique called transcranial direct brain stimulation (tDCS) can use low-level electrical currents to enhance or suppress activity in regions of the brain. A subject undergoing tDCS has sponge-tipped electrodes placed on their head, and when current is applied, will feel at most a tingling sensation. Depending on the type of current and the region to which it is applied, tDCS has been shown to influence thought processes, making subjects, for example, less depressed or temporarily better at math. Experiments had already shown that tDCS could boost or suppress activity in the rIFG, so Farias reasoned that if religious belief is regulated by cognitive processes centered there, tDCS would be able to manipulate it. “The idea was to test whether or not people who are believers decrease their levels of belief by activating this region,” Farias says. 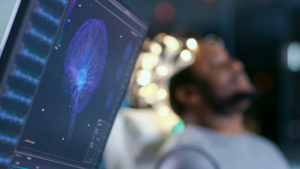 With his colleagues from Coventry University, he designed a double-blind experiment in which patients received true tDCS or a placebo treatment while performing computer tasks designed to show both their level of intuitive reasoning and their belief in supernatural concepts. The group’s findings showed that, while tDCS did manipulate the subjects’ cognitive inhibition processes, it had no effect on their levels of religious belief. In science, when you reach a null result, you can abandon the experiment entirely, seek to replicate the experiment, or approach the data from a novel angle. In a 2017 article published in Scientific Reports, an open-access online journal published by Nature, Farias and a group of 10 co-authors revealed their tDCS results in parallel with two additional studies that investigated the relationship between rationality, intuition, and religious thought through very different techniques. One experiment concerned a series of mental exercises designed to gauge subjects’ propensities for intuitive thought through an experimental manipulation. The other was a field study in which subjects traveling on the historic Santiago de Compostela pilgrimage route through France and Spain were tested on their levels of intuitive and religious thinking to see if there was any association between levels of intuitive thought and the number of days that the subjects had been on their pilgrimage. Despite their very different approaches, all three studies failed to show any association between intuitive thought and religious belief. “We suggest that whether you believe in the supernatural has much more to do with culture and the way you are brought up than with any sort of cognitive constraints,” Farias says. Indeed, since the publication of Farias et al’s own three-part study, Will Gervais, another Templeton grantee and the author of one of the original papers that suggested a connection between spirituality and intuitive thinking, has released a follow-up correlation study done using a cross-cultural sample which failed to find a link between religion and intuitive thinking in most of the countries under study. In 2017, a replication of Gervais’ original 2012 study failed to show that analytic thinking decreases religions belief. Despite the definitiveness of these recent results, Farias says there may still be more to be said about subtle relationships between intuitive thinking and religious cognition — his co-author Valerie van Mulukom is currently investigating ways to see whether or not intuition correlates with less-structured forms of supernatural belief such as magical or paranormal thinking. For his part, Farias has shifted his focus to understanding the ways in which atheists and agnostics might nonetheless maintain some form of supernatural beliefs. Read the article outlining Farias and his colleagues’ results in Nature Scientific Reports.